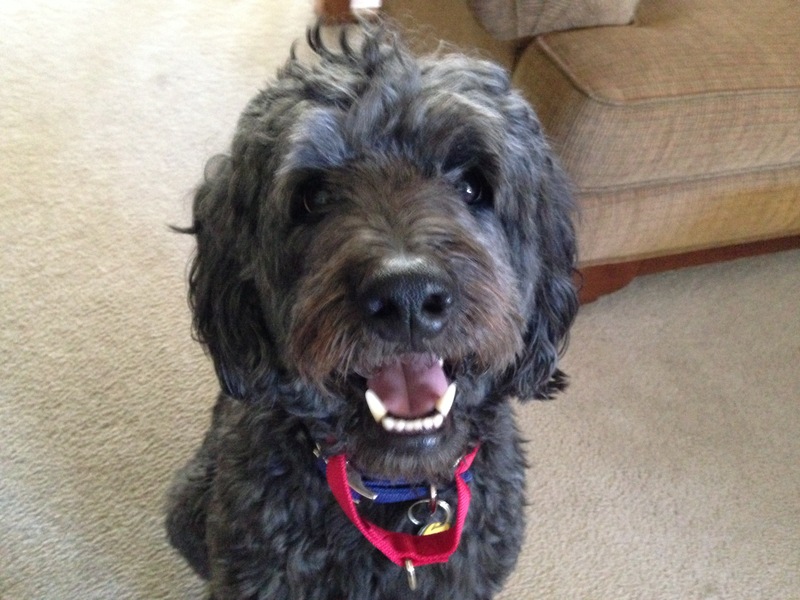 Finnegan is a five-year-old English Setter / Poodle mix. His guardian called me in to help stop his strong reaction to other dogs in order to help him to take a dog receptivity test for Love on a Leash. Finn was a little territorial in his barking when I arrived for the session. His guardian was able to move him back form the door so I could come in, but it did take a number of corrections. Unlike most of my client’s dogs, Finn is very well trained. His guardian takes him to work where he meets and encounters many people. He told me that when Finn is in that setting he has impeccable manners, listens well and needs few corrections. But when he is at home or on walks, he has become more and more reactive and even territorial. This is a great illustration on how training and behavior are different. His guardian spent a great deal of time working with the dog at work to get him to behave in a specific way. But when the dog is at home or out on walks, he is acting on his own. The reason for his reactive nature in these settings was due to a misconception that he had the same rank or authority as his guardians. At home, Finn had few rules, was given affection for no reason and sometimes when he was reacting in an unwanted way. When we provide a dog with affection, they interpret that as meaning that we agree with what the are doing at that time. So petting a dog to calm it down or placate it only reinforces the exact behavior you want to stop. To help the dog stat to see and respect his guardians as having more authority, I suggested some simple rules and structure to incorporate into the dog’s life. By adding limits and boundaries, we redefine the leader follower dynamic in two ways; by limiting the dog’s access to everything, we help it start to see it is governed by limits. And each time a human disagrees with the dog in a way it understands and respects, the human gains some status or authority in the dog’s eyes. I went over some non verbal methods of communication with Finn’s guardian. By using movement, body posture and language to communicate and disagree with the dog, we speak to it in a way they instantly understand. I suggested that the guardian start petting the dog for a reason. While its ok to pet a dog because you want to, it can have a positive impact on the dog’s behavior to pet it for doing the things you want it to do like sitting, recalling or laying down. When a dog breaks the rules, I suggested the guardian apply a set of escalating consequences. By having a next move or step to go to, we can avoid repeating a command over and over. when a dog doesn’t comply. Doing this only weakens the dog’s respect for your authority. Instead of applying some punitive measure (which dogs don’t really learn from), my first consequence is to stand up abruptly and turn so that my shoulders are facing the dog. To a dog, standing up and facing it is the most authoritative and confrontational posture a human can take. This sends a strong, “I mean business” message. If the dog continues breaking the rules, my next consequence is to march right at the dog until it turns away or sits down. Dogs give and take territory when confronting another dog. By making the dog leave the area or assume a less authoritative posture like sitting or laying down, we help it move into more of a follower mindset. To practice applying these consequences, I ran the guardian through a leadership exercise that asks the dog to leave a treat alone even though its laying right there on the floor. Mastering the leadership exercise will help Finn practice controlling himself. A skill that will be needed to stop him from being so reactive at the sight of other dogs. When we were wrapping up the leadership exercise, someone passed by the front of the house walking a dog. I stepped out and asked if he would mind walking his dog back and forth in front of the house a bit so that I could see Finn’s reaction. As soon as Finn saw the other dog he started to lower his head and stare. The second I saw this happen, I gave him a quick correction that stopped him as he look dup at my face. As the dog walked past, Finn kept trying to instigate things. By disagreeing with him with good timing, I was able to get him to settle down rather than barking or growling at the passing dog. By redirecting Finn’s attention and eyesight, his guardian will be able to get Finn to stop looking then reacting to nearby dogs. Additionally, over time this providing of a positive reinforcer will help Finn start to associate an approaching dog with the receiving of a treats. One factor many people don’t consider is a dog’s state of mind and energy level before it leave the house on a walk. Many people’s dog’s get over excited as their guardian goes to put them on a leash. By the time they get to the door, the dog is so excited, its almost guaranteed to get into trouble. I had Finn’s guardian show me how he got him ready for a walk. While Finn wasn’t out of control excited, there was a reaction to the ritual of getting ready for a walk. I showed his guardian how to get Finn to settle himself down by pausing or stopping the instant the dog started to show excitement. When we got outside I went over some rules and structure to add to the walk itself. Instead of letting the dog do as he pleases on a structured walk, we can literally lead the dog. Each time we correct the dog for getting out of position or trying to take the lead, we can help redefine the leader follower dynamic even more. To help give the guardian even more control, I replaced the harness he was using with a Martingale collar and showed him how to add the special twist to the leash. Finn looked a bit uncomfortable at first so I took the leash and walked him back and forth in front of the house a few times so he could get used to it and I could demonstrate to his guardian how to use it. It only took the guardian a few steps before the dog was walking next to him. At first he tried to do as he pleased, but minor corrections easily got the dog back into position. In many cases, simply assuming more of a leadership role in ways the dog respects will slow down and even eliminate a dog’s reactivity. Because Finn’s reaction isn’t really strong, its possible he will fall into that category. But in case he does not, his guardian may need to schedule another session to work on counter conditioning the dog’s reaction to the sight of other dogs. By the end of the session, Finn was interacting with his guardian in a more respectful way. He was keeping a little distance, looking to him for cues and responding to commands even faster than before. The more the guardians assume the leadership position in the dog’s eye’s, the less reactive he will become. Instead of reacting and trying to control the situation himself, Finn will defer to his guardian and let them worry about it. This will allow the dog to relax and embrace more of a follower role on his own instead of just when at his guardian’s work.